Written by Jaxon S on July 22nd, 2008 in Borneo Diaspora. Anyone related to Howard Ng of Sandakan and Joan of Kudat? Because if you are, you are somehow connected to Barack Obama. Here’s how. Ng and his wife, Joan, both Sabah-borns, migrated to Canada a more than three decades ago. Their son Konrad Ng was born there and later ended up in Hawaii to pursue his education and career. He is now an assistant professor at the University of Hawaii. 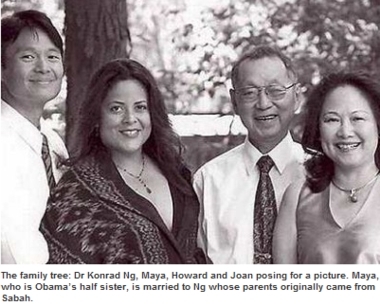 While in Hawaii, Konrad met Maya Soetoro, who is Obama’s half-sister. They later got married. Maya was born to Lolo Soetoro, an Indonesian businessman and Stanley Ann Dunham, Obama’s mother. “I have many relatives who live throughout Malaysia, especially in Kuala Lumpur, Kota Kinabalu and the two towns where my parents came from,” Konrad, 34, told The Star. The Star did not mention who is the older — Obama or Maya — but after some research, it was clear that Maya is the younger one. 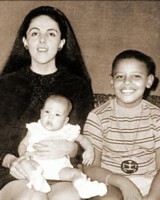 Below is a picture of Obama as a young boy and the toddler Maya, with their mother Dunham. Obama was born “Barack Hussein Obama II” at 7.24pm in Oahu, Hawaii on August 4, 1961. So I guess, Dunham had married Soetoro about several years after Obama’s birth. “He has a thorough understanding of the challenges we face and sound judgment on how we should address these challenges. “Barack is a dedicated family man and cares deeply about transforming the world into a better place so that all families will have the same opportunities to do better,” he told The Star. What happened to Obama’s father? He died in a car accident in Nairobi in 1982.